The BBC is to launch a new redesigned BBC Sport website which will focus on live coverage, as the UK gears up for what is likely to be an unforgettable year of sport in the country. The new site will be going live some time in the early hours of tomorrow morning (Wednesday, February 1), so you’ll likely encounter the new layout when you first log-in tomorrow. 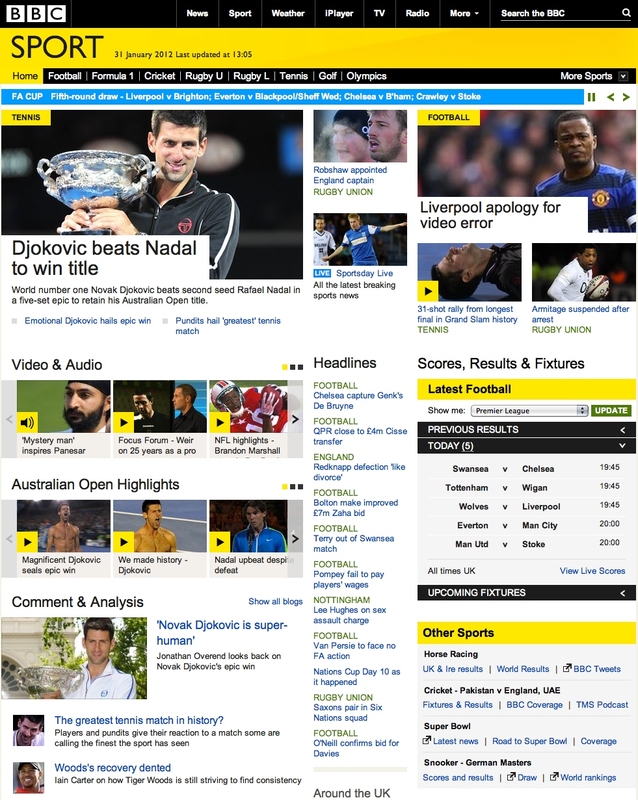 The new design will be applied to all global variants of the BBC Sports site. This is the first major update that BBC Sports online has had in almost a decade, and is indicative of the changing needs of sports fans as more licence-fee payers hit the World Wide Web to get real-time information on events as they happen. With that in mind, live coverage will underpin the new design, with a heavy focus on text commentary covering key events, audio & video, and highly visual and immersive, up-to-the-second tables and stats. BBC Sport online is the most popular Internet sports service in the UK, pulling in almost 12 million users a week. And whilst we’ve not been able to properly check out the new site yet, we have had a glimpse at it, and it does seem to have a cleaner design, similar to what has already been introduced on other BBC sites such as News. The BBC is also introducing new social features to make content-sharing easier, and we’re told that ‘comment modules’ will be added in the coming months. With the London Olympics only months away, and England taking part in the UEFA European Football Championships in Poland and the Ukraine, the BBC is clearly gearing up for the anticipated influx of sports-related traffic. We can expect to see a number of other big changes throughout this year, covering PCs, connected TVs and smartphones. Back in November we reported on the full public launch of the BBC’s new Homepage, which is the broadcaster’s third most popular section after News and Sport. Indeed, we noted at the time that the new design principles will be rolled out across many other BBC online services gradually, leading to what it called a “graphically-rich London 2012 Olympics digital offering”.